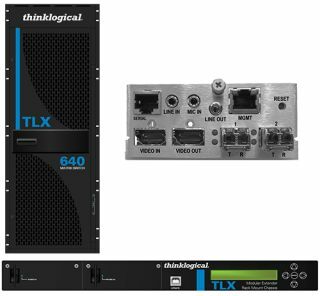 The What: Thinklogical's new TLX Series matrix switches and extenders will be showcased at InfoComm 2015, June 17-19, in Orlando, Fla., at the Thinklogical booth # 3479. The What Else: TLX is the first KVM system in the market able to deliver extension and switching of full, uncompressed 4K video at full resolutions and color depth (4096 x 2160 resolution, 4-4-4 color depth) at 60 Hz frame rate using only two fibers or CATx cables. TLX offers customers industry-leading 10 Gbps performance and a flexible and efficient uncompressed signal architecture, reducing the cost and infrastructure required to manage content created in the growing 4K standard and increasing productivity without compromising quality, resolution, or performance.